The Converse Blog: Bobby Jackson Converse Ad. Bobby Jackson was drafted in the 1997 by the Sonics with the 23 pick and was traded to Denver before the season began. Jackson was one of three first round picks that Converse signed along with Brevin Knight and Jacque Vaughn. Ron Mercer, also from the 1997 draft, would later on wear Converse in the NBA after previously wearing Converse at Kentucky. I remember seeing this ad in a Sports Illustrated when it first came out, but I had forgotten about it until recently. This was during the "Stay True" campaign during the time that all Converse basketball shoes featured the Chuck Taylor Ankle patch. I love this ad because it's straight forward and it works well using the idea of less is more. 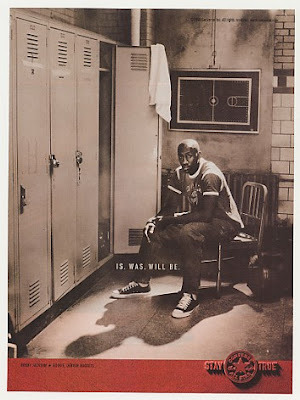 It's just Bobby Jackson sitting in a locker room with the tag line, "Is, Was, Will be." While all three of players never went on to be stars in NBA, they've all expereinced long careers in the L. I always love this time of year because the finals are coming and right after that we get the draft. The draft is a chance every year for teams and company's to experience growth, potential, and youthful energy. I am already looking forward to see who Converse will sign from this class. Thanks for checking out the blog, don't forget to vote and leave some comments. Follow us on Twitter too!!! !